The old gym was a tinder box, packed with fire-breathing property owners. And I was there, a curious observer, in the middle of this fiery oratory over proposed countywide zoning. It’s the closest I’ve ever come to being engulfed in a riot. Zoning—by any name, including land use—was a fighting word to the crowd. Out-of-town experts were explaining the benefits of land-use guidelines. But midway, the local chairman avoided mayhem by rapping his gavel and declaring, “This meeting is adjourned!” The well-intentioned guests slipped out the back door, before the mad mob could accost them. That was 20 years ago, and the subject has been dormant ever since. I understand why elected officials are leery of perching on that powder keg when so many of their constituents are ready to strike matches. And as a landowner, I like my rights. As long as I don’t break a law, I want the freedom to do as I wish on my parcel of dirt. But it’s not that simple. Your land or my land connects with adjoining land. What we do affects others, and neighbors have rights to protect their pieces of earth. And that’s when emotions can overheat. No better example of that kind of controversy exists in the county where a land-use discussion almost caused a riot. The other night, my nose wrinkled when I got out of my truck at a friend’s home. Darkness hid the source of the new odor, but I recognized the pungent smell of chicken manure. My friend and his wife had been living on the rural road for 30-plus years. An investor had just constructed four chicken houses 400 yards away. With no county restrictions, the owner was within his rights. But in doing so, his enterprise affected dozens of homeowners nearby. He smelled opportunity and money. His neighbors sniffed, well, chicken manure. Is it fair for one person to adversely affect his neighbors? In a perfect world, people would be considerate of how the ripples of their tossed-pebble-in-the-pond splashes on others. But this is not a perfect world. That’s why we sometimes have hard-to-swallow regulations. You may not appreciate land-use planning, until the proverbial pig parlor or chicken house pops up on the other side of your fence. This isn’t about being against eggs, fried chicken, pork chops or the people involved in their production. It’s about harmonious living. 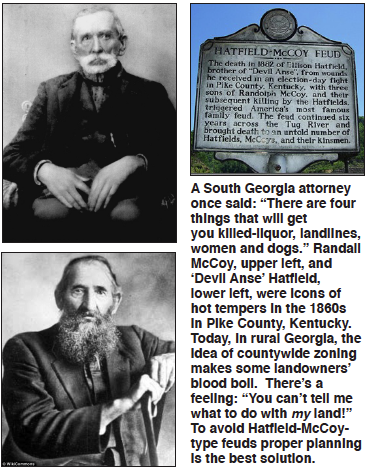 The conundrum is how to fit these puzzle pieces together, without creating a Hatfield-McCoy feud. So, how do you avoid that? There is no simple solution, just as in the current mining debate in Wayne County. I recognize the arguments on both sides. Many of my friends have been in their homes for 50 years or longer. I understand why they don’t want industrial digging out their back doors. Years ago, I had a homeowner complain about the dust and stench of the Goose Creek Landfill. I was empathic until I learned that he chose to build his house next to the existing county dump. You shouldn’t buy a house by the airport and then complain about the noise. But that’s not the case of the adjoining landowners who are opposing the Dupont mine. This controversy caught them by surprise. Now, suppose you are the landowner who has marketable minerals or the company with deeded-rights to extract those deposits. Is it fair to deny them from claiming what is lawfully theirs? If it were your land, wouldn’t you be yelping? However, just like the farmer who plans to build chicken houses in an established neighborhood, the mining interests should consider the consequences for their neighbors. Life isn’t always fair or easy. Furthermore, after-the-cow-is-out-of-the-barn compromises are hard to come by.